As mentioned above, the simple fact that Battlefront 2 will even have a single player campaign has gamers and Star Wars fans excited everywhere . But to makes things even more meaningful, it is actually official canon. It will take place between the events of the orignal trilogy (Return of the Jedi) and The Force Awakens detailing the events after the Death Star 2 has been destroyed. The game will be told, for the most part, through the eyes of the rebuilding Empire where players will take control of an elite Imperial Commander by the name of Iden Versio. Although it’s pretty clear we will be playing as both Luke Skywalker and Kylo Ren at some point in the campaign. Basically the game has about 30 years of material to source from in some way or other, so it should be exciting for Star Wars fans looking for more than just your typical arena shooter with Wooky skins. As for multiplayer, it will be there and will not require a season pass this time around. Whether that’s EA deciding to be nice to its fans or just making up for the downfalls of Battlefront 1, we’ll take it. You can also expect local offline split-screen couch co-op (sweet! ), but that will be exclusive to the console version of the game. GCU members that pre-order the game on Xbox One, PS4 or PC for $47.99 will receive a $10 Best Buy Rewards Certificate as well (valid for My Best Buy members only, you can sign-up here for free). That’s the lowest we have seen on a pre-order for a AAA title in a while. 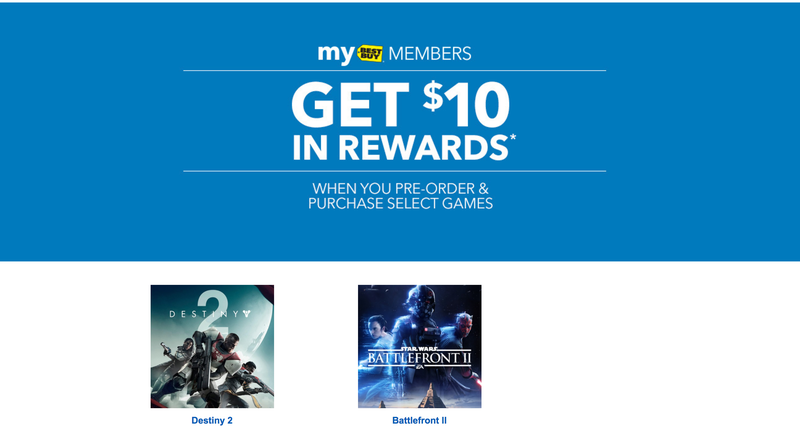 Best Buy is also offering the same deal with the $10 Rewards Certificate on pre-orders for Destiny 2 as well right now. Head over to our Games/Apps Guide for all the best deals across every platform, every day of the week.